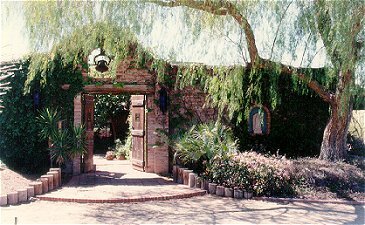 Enjoy the flavor of an old Spanish hacienda in a peaceful, secluded desert setting with mountain views attractive to nature lovers and romantics yet convenient to restaurants, hiking, entertainment, and shopping. Spend evenings stargazing in one of our two outdoor hydrotherapy spas. A leisurely, continental plus breakfast is served in the Mexican courtyard with fountain and flowers, on a porch with mountain views, or in the Great room dining area with a fire burning in the large fireplace in cool weather. A spacious king room, two queen suites, and two-bedroom Casita with private outdoor spa and patio provide luxurious comfort. Our smoke-free accommodations are ideal for either short or extended stays. Each offers sleeping for four, private bath, TV/VCR, telephone, private entrance, an ornate antique heating stove for cool evening ambiance. Three offer kitchenettes. Our award winning interior design is casual, colorful, and eclectic.